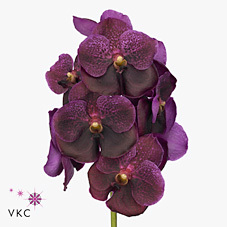 Please note - All Vanda Orchids are priced by the flower bloom, not by the stem. There are multiple flower blooms per stem - usually 16 - 25 as stated. If you are unsure about this, please call us for advice on 01394 385832. Orchids are one of the most exotic and stunning flowers available on the wholesale flower markets. Originally, all orchids were imported from hotter climes, but nowadays are successfully grown in carefully regulated greenhouse conditions in Holland.